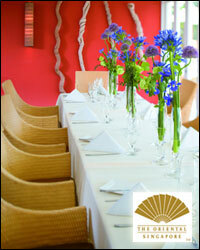 With the assistance of Susur Lee, Club Chinois was opened in 1997. Today, as an epitome of trendy dining, Club Chinois is one of Singapore's leading modern Chinese restaurants by the Tung Lok group. 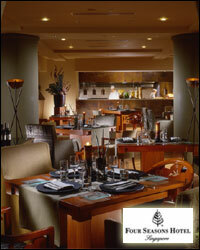 After a revamp in 2004, the restaurant revealed a swanky interior, complete with sleek interior design and avant garde soft furnishings that evoke a seductive feel. Known for its exquisite and creative modern Chinese cuisine, Club Chinois was awarded the World Gourmet Summit Awards of Excellence Asian Ethnic Restaurant of the Year award in 2002. It was also nominated in the same category in 2003 and 2004. 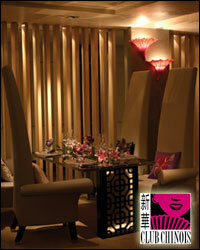 The restaurant is also one of the first Chinese restaurants to have an extensive wine cellar in Singapore. The signature restaurant of the luxurious Oriental Singapore, Dolce Vita exudes contemporary charm and offers a refreshing palette of Mediterranean flavours. Taking a cue from its sunny position with an unobstructed view of the pool, the cuisine is appropriately influenced by the uncomplicated flavours and creative cooking of the Mediterranean. Guests dining al-fresco at the patio by the pool are treated with tantalising glimpses of the city's skyline in the distance. The understated Oriental Singapore has been voted as one of the top three Best Overseas Business Hotels in the annual Reader's Choice Awards 2005 of Condé Nast Traveler, UK, and as one of The Greatest Hotels in the World 2004 by Travel + Leisure USA. 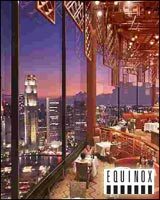 Take in the breathtaking views of Singapore and neighbouring Malaysia and Indonesia as one steps into Equinox Restaurant, which is located on the 70th floor of Raffles the Plaza. Simple and bold design elements perfectly complement the settings and architectural style, reflecting the exotic essence of Asia. 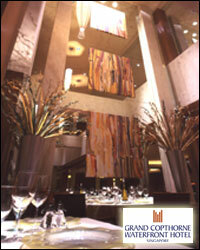 Equinox Restaurant features a unique food concept, offering guests a choice of Western or Asian cuisine from two supporting kitchens. Multiple menu choices provide patrons with the opportunity to enjoy varied and multi-dimensional culinary experiences, making even the most informal of occasions, truly special. Please click here for special offers from the hotel. An exciting lifestyle restaurant that provides nine different dining concepts in a single venue, mezza9 offers a multitude of culinary delights capable of satisfying diverse taste buds with their mouth-watering selections of East and West. An international spread of favourites like fresh sashimi, Western grill, pastry and dim-sum are available freshly prepared by the team of chefs at the various stations. Take in the scenery of the bustling Scotts Road in Mezza9's glass-enclosed award-winning martini bar, which has one of the largest selections of martinis in Singapore, a must-try for all martini lovers. 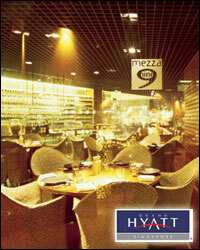 With its 400-seat capacity, Mezza9 delivers the highest culinary standards for exceptional wining and dining. Warm and casual yet possessing an air of sophistication, One-ninety promises to induce and intrigue all. Frenchman Frank Ruidavet, the executive chef of One-ninety, presents a cuisine that is steeped in European tradition yet infused with Asian flair, presented in modern style. The menu itself is an expression of the glory of European gastronomy with touches of influence from a diverse spectrum of culture, perfectly brought out by the well-travelled chef. With its warm wooden floors, open display kitchen, communal dining and unique d�cor setting the stage for a vibrant ambience, One-ninety's hospitable and friendly service staff sets the stage for a lively and interactive dining experience. Pontini offers the traditions and hospitality of Italy in its enticing fine fare which allows no room for generic interpretations of Italian food. Every item on the menu is a result of years of honing and fine-tuning, a proud presentation of authenticity and freshness of ingredients. In the main dining hall, the elevated seating area with the impressively high ceilings and the timeless Italian furnishing seems to bring diners back to ancient times, when kings and noblemen dine in majestic grand courts. And yet, the touch of modernity is able to amazingly add sleekness and blend seamlessly with traditions to give the environment a touch of modernity, enticing the diner to no end, making dining an unforgettable experience. Light and simple, yet imaginative and original, the cooking style of the Raffles Grill is rooted in French classical tradition, with contemporary overtones. The cuisine, as they proudly say, has been unabashedly updated to suit today's demanding gourmets, appealing to the five senses in perfect harmony. Set in the timeless grace of the Raffles Hotel, Raffles Grill's classical interior conveys the magnificence of the restaurant's illustrious history and traditional hospitality. The celebrated wine cellar consists of great vintages from the traditional regions of France, Italy and Germany as well as from the newer wineries in New Zealand, Australia, California and South Africa. 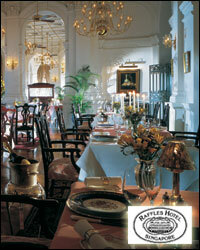 Amidst the gracious hospitality and fine cuisine, Raffles Grill gives a delightful experience that will be long remembered.